The vast majority of Colombia’s citizens are connected to the power grid and receive electricity from low-emissions sources like hydropower and natural gas. That’s a good thing. Unfortunately, many people in rural areas have no access to electricity or have to rely on dirty and expensive diesel generators. 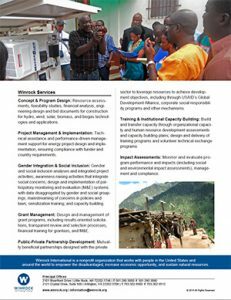 This program helps expand renewable energy and energy efficient technologies to underserved populations through technical assistance, project development and policy reforms.